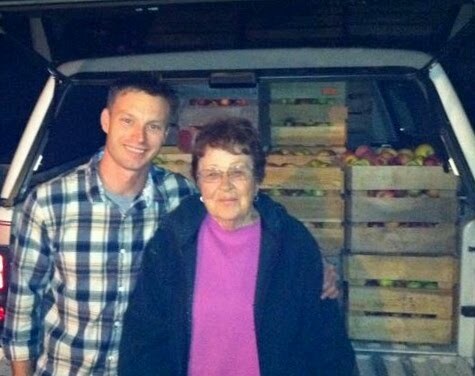 Lee's Orchard began as Andrew and Willa Lee’s farm in Columbus, Indiana, as a young family homesteaded their acreage west of Columbus, Indiana in the 1960's. The farm originally included a large garden and a variety of fruit trees and berries for family use and was also home to a chicken coup and a small beef cattle herd kept on pasture, and over the years a pack of dogs, pigs, guinea hens, and even a goat (named Mollie) came and went from the farm. Andrew worked for Cummins engine company for most of his adult life, but loved the outdoors and made plans to retire to the farm which he converted to an orchard; growing apples, pears, peaches, cherries, and berries. Now his wife Willa, son Everitt, grandson Josh Lee, daughter Sherry, and cousins Mike and Eric Harper, work the orchard. Growing a wide variety of apples including: Lodi, Jersey Mac, Pioneer Mac, Empire, Ginger Gold, Jonathan, Cortland, Gala, Rambo, Red Free, Jonafree, Mutzu Crispin, Arkansas Black, Goldrush, Grimes Gold and more. In addition to apples, the orchard also has five varieties of pears, the popular Bartlett and two dessert varieties, the Stark Delicious and Magness and several variety of plums. The Lees also keep bees on the orchard, currently having five hives. The bees pollinate the orchard, and the family collects and sells the honey. What you'll find on this site? More about Lee's history and culture, an over abundance of family value and love, some education and advice with a smattering of recipes using the delicious products mother nature so freely and sweetly gives us annually. Enjoy!